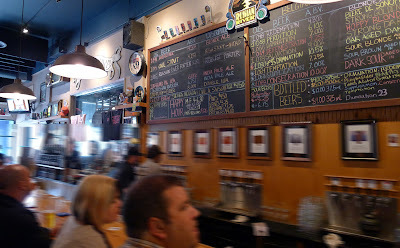 Getting back to my post-Thanksgiving Day tour of California, the second stop was Russian River Brewing in Santa Rosa. As noted in the previous installment, Bear Republic was the first stop. 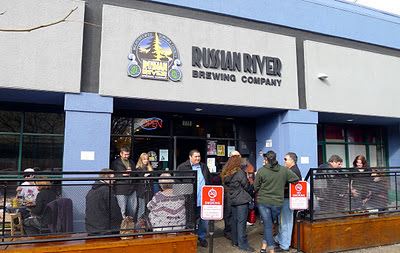 Russian River was the inevitable second stop, since it is located between Bear and Lagunitas. I had high expectations for Russian River. As most beer fans know, they produce some excellent beers, including Pliny the Elder, Blind Pig IPA, Damnation and others. There was probably no way my expectations for this place could have been met. First, Santa Rosa. The city was bustling, with lots of traffics and people everywhere. If you're fixing on visiting Russian River, it's pretty easy to find. But the availability of parking is not good and the street parking is not cheap. We were lucky to get a place not far from the pub. That's where our luck ran out. The place was packed to the gills. It isn't a huge space to begin with, and the hype surrounding this place is evidently bringing in the masses. After waiting in line for a few minutes, a snarky little "greeter" told us it would be about 40 minutes for a table. Terrific. While my travel companions waited in the outdoor seating area, I looked over the beer menu on the board above the bar. All the usual stuff was there and more. The folks at Russian River, like brewers in Oregon and elsewhere, are engaged in barrel aging and sour beer production. This was news to me. But I digress. I hung out in the four-deep mosh pit by the bar hoping to get the attention of a bartender. Finally, one asked me what he could do for me. 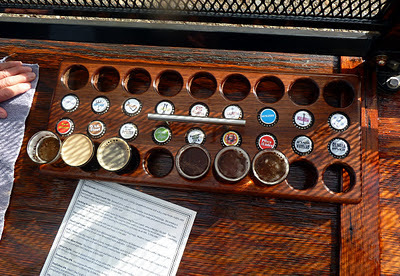 Since I knew there was no seating and this was going to wind up being a quick stop, I ordered the base taster tray...Aud Blonde, O.V.L. Stout, Porter, Russian River IPA, Blind Pig IPA and Pliny. The mistake soon became apparent. The standard beers were all pretty good. Russian River hasn't made a name for itself with its porter or stout, but those beers were fine. It's the IPA swell that RR has been riding to fame and (I guess) fortune. All the IPAs in the taster tray were good. Pliny has been a favorite of mine, although I'm starting to think it's a bit over-hyped. The thing is, I should have ordered some of the specialty beers they were featuring. The list was tantalizing. Had things been a little less frenetic around the bar, I likely would have tried to order some combination of barrel-aged and standard beers. Oh well...life goes on. Russian River makes some fantastic beers. No doubt about it. But my sense is they've had a little too much success and received a little too much hype for their own good. That might help explain the snotty, snarky comments and slow service. As far as I'm concerned, if I'm looking for condescending attitudes and snarky commentary, I'll go wine tasting. 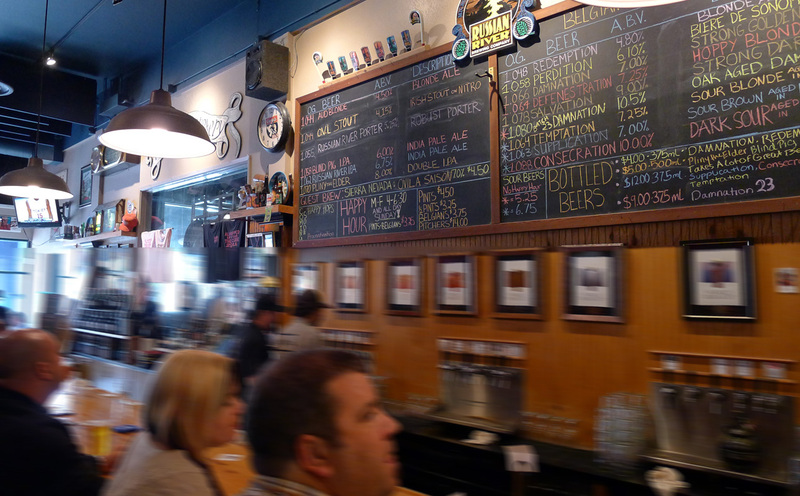 If you're planning a trip to Russian River Brewing, my advice is to visit when the place isn't teeming with yuppies. Good luck with that. "Pliny has been a favorite of mine, although I'm starting to think it's a bit over-hyped." I'm conflicted about sour beers, and some of RR's like Supplication I consider to be undrinkable. But I was pleasantly surprised by my trip to the pub in Santa Rosa earlier this year. I expected a much snootier kind of spendy gastropub experience, but instead it was a pretty down-home place that would fit in well in Portland. The food was reasonably priced and serviceable, and we didn't get any snarky attitude when we were there. Lots of anklebiters running around was the main annoyance for us. Hahaha. I'm just trying to maintain a semblance of journalistic integrity here. Russian River sucked when I visited. I think that was largely due to WHEN I visited. I'll definitely check them out again. I liked the pub...it's just too small for a huge crowd. Cheers!